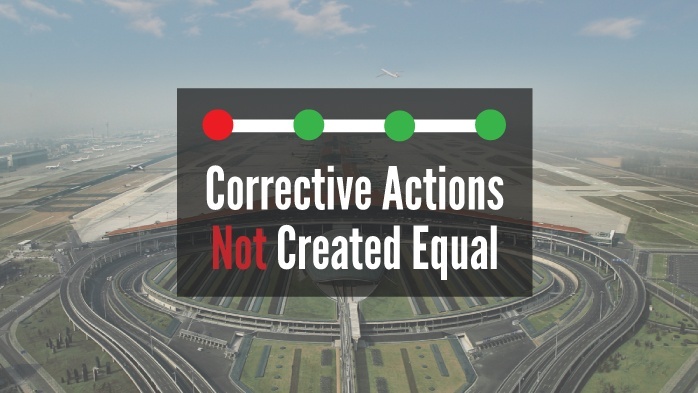 Corrective preventative actions are used to correct any undesirable element of your safety program. They are created in response to safety concerns, such as safety incidents, investigations, audits, etc. Their sole goal is to bring adverse elements of your SMS into an acceptable level of safety (ALoS). You might also see them called CAPAs (Corrective Actions, Preventative Actions). CPAs are most often created and facilitated by subject matter experts, which most often are department heads. Initial mitigating actions: Important actions taken immediately in response to high risk issues, in order to mitigate the high-risk threat (damage control, emergency response, etc.). Most people have heard of short/long term CPA types, but initial mitigating actions (may go by other names) are an emerging classification of CPAs in SMS programs. Communicate to the person assigned the CPA that this CPA is top priority. Initial mitigating actions should be completed as soon as possible in response to high risk safety issues (such as same day, one day, or two days). They can be either short term or long term – but this is irrelevant – so long as the initial mitigating action(s) bring the safety concern into a manageable level of safety. After that, management can use “regular” CPAs to bring further reduce the issue into an ALoS range. Initial mitigating actions should be used in response (reactive risk management) to an initial high-risk issue classification. In SMS Pro, Initial Mitigating Actions are a selectable option during CPA creation; when the CPA is created users will clearly be able to see that it is of this type. In your program, you will simply need to clearly indicate that the CPA is an Initial Mitigating Action. Due within two days of assignment. In SMS Pro, this hard-due date is equal to the closure date for the issue. Again, the point is complete this type of CPAs as soon as possible. Once you begin classifying CPAs as this type, you can track performance for these critical CPAs. For example, in SMS Pro, when users choose to use initial mitigating actions, they can see On-Time Completion performance for initial mitigating actions. This gives safety managers a strong basis for assessing critical-issue response performance. Ensure a consistent way of clearly marking this CPA assignment type.